These two new SE models may come in at an entry-level price, but they are both highly capable capacitor mics, each with a distinctly different sound character. 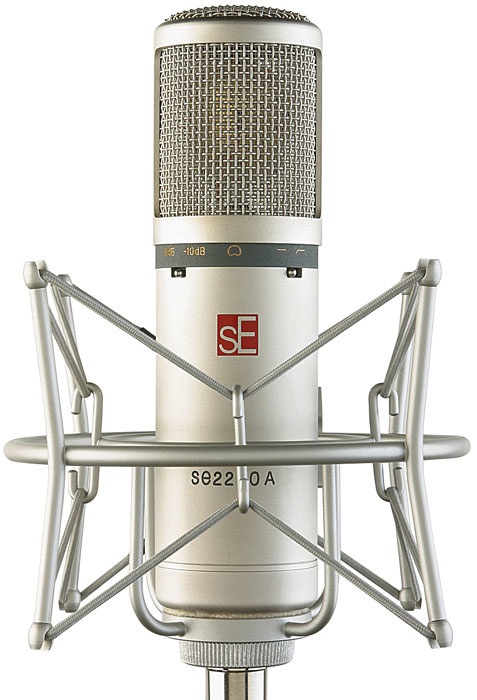 Microphone manufacturer SE Electronics are a US-registered company with their own production and design facility in Shanghai, China. Over the past few years they've managed to carve out a reputation that sets them apart, both visually and philosophically, from the many 'me-too' Chinese mic brands, most of which originate from a handful of very large microphone factories in Beijing and Shanghai. Both of the studio capacitor mics we're looking at here are from the affordable end of the SE range, and both are side-entry, large-diaphragm, cardioid-pattern models designed primarily for recording vocals. However, each can also double up as a general-purpose instrument mic. The SE Mini is an attractively priced, fixed cardioid-pattern microphone that comes in a very nice (and compact) aluminium case. There's no shockmount included, but the integral swivel mount (which comes with a mic-stand thread adaptor) can be removed if you want to use the optional shockmount with the microphone. The Mini's true capacitor capsule is slightly larger than that used in the 2200A, so I'm assuming that this is one of SE's 1.08-inch designs. 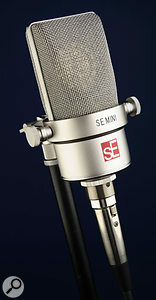 Visually, the mic features a conventional mesh basket over a very short, stubby body (95mm x 146mm overall) not entirely dissimilar in proportion to a well-known European mic of enviable provenance, but there the similarity ends. The Mini is unashamedly a no-frills microphone and has no pad or roll-off switches. SE appear to have cut features rather than build quality in order to meet their target selling price, which makes sense to me. There's a red SE logo to tell you which side to sing into, and that's about it. 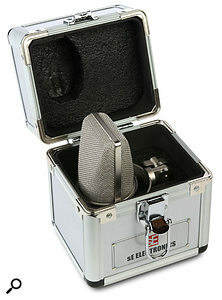 Both mics come with an aluminium case as standard. Despite its simplicity and low cost, the Mini is a very capable little microphone and even without a pad it can handle SPLs as loud as you're likely to encounter in the studio (130dB), with the possible exception of the kind of levels that occur inside a kick drum or the bell of a very loud brass instrument. Its frequency response extends from 20Hz to 20kHz (although without a frequency plot or roll-off limits this doesn't convey much useful information, and gives no clue as to the position or shape of any presence boost). The Mini's sensitivity is a very typical 20mV/Pa: -37dBV ± 2dB (0dB=1V/Pa 1kHz) and the output impedance is 200Ω — again, typical for this type of microphone. Equivalent Noise Level is quoted as 18dB, A-weighted; low enough to be insignificant for most close-miked applications, although given the figures achieved by companies such as Rode for mics in a similar price range, I feel it could be a little lower. Phantom power (48V, ± 4V) is required to operate the microphone. The slightly more expensive, cardioid-pattern 2200A model replaces the original 2200 (reviewed in SOS September 2003) and has so many redesigned features that it is really a quite different microphone. The metal body has a matte-silver metal plate finish, with a grey trim line around the centre, and the base unscrews to provide access for servicing — or for inquisitive reviewers. Tapping the metalwork and grille reveals a sensibly low level of mechanical ringing, and the grille design offers the capsule good physical protection without affecting the acoustic space around the capsule in any significant way. As with most of the updated SE mics, more use has been made of surface-mount components in the 2200A, although there are still some discrete parts (specifically transistors and an FET), as well as an output transformer. At the heart of the mic is a one-inch, gold-on-Mylar diaphragm capsule. In contrast to the simpler Mini, the 2200A has switches for a 10dB pad and low-frequency roll-off. The mic comes well packed in a foam-lined aluminium mini-flightcase bearing the SE logo, and as this is a more sophisticated package than the Mini, it comes complete with a substantial metal shockmount. A spare elastic suspension band is, thoughtfully, also included. Turning to specifications, the mic has the usual 20Hz-20kHz frequency response and a sensitivity of 14.1mV/Pa: -37dBV ± 1.5dB. The weighted Equivalent Input Noise is a dB better than for the Mini, at 17dB, which is quiet enough not to be problematic, but still not as quiet as it could be, given modern component technology. Maximum SPL is 125dB, which rises to 135dB with the pad switched in, and the usual 48V phantom power is required. My first test was with the Mini, which delivers a very neutral, crisp vocal sound with an 'airy' high end. It also works nicely as an acoustic-guitar mic, bringing out the string definition nicely, and because it doesn't have a very 'obvious' character it can tackle most jobs without sounding out of place. By contrast, the 2200A produces a noticeably smooth, comfortable sound, with a slightly fatter low end and well-defined, but silky-smooth highs. The 2200A's frequency plot shows a gentle bass hump at the low end, matched by a very wide, shallow rise at the high end, giving the mic a slight 'smile' characteristic that is both subtle and flattering. Its pickup pattern is fairly tight, but not so tight that the slightest movement by the singer affects level and tonality. As with the Mini, it needs to be used with a pop shield for any close vocal work, but on the whole it behaves predictably and musically. It also works well as a general-purpose instrument mic, tackling anything from acoustic guitar to hand percussion. Both these mics sounded subjectively quiet when used for spoken-word recording, which is generally lower in level than sung vocals, and therefore more revealing of noise problems. The 2200A definitely has a flattering nature, but in a very gentle and musical way, while the Mini seems to have more of a no-nonsense approach and makes no obvious attempt to disguise what's really there. This makes it sound less warm than the 2200A in a direct shoot-out, but in reality I think it actually has a pretty well balanced sound. Each of these mics can produce excellent results when used with a modicum of care, but if you need a warm and polished sound, rather than a no-nonsense representation of the facts, you'll probably lean towards the 2200A. It also seems a little 'louder', though the specs for sensitivity suggest that the Mini should have more output, but both mics deliver sufficient level that you don't have to run your mic preamps flat out, so I have no significant concerns in that respect. Although the 2200A costs more, it has the practical advantages of those pad and roll-off switches, as well as a very decent shockmount, but don't dismiss the Mini, as in many instances a shockmount may not be necessary, and this mic can produce great results. Judged on technical specs alone, these SE mics are little different to the majority of their competition, but where they are distinctive is in their sound. The Mini's high-end is more assertive than that of the more 'comfortable' sounding 2200A, but if your vocalist lacks definition this can be a positive attribute, and it also helps to bring out the articulation of acoustic guitars and assorted percussion. 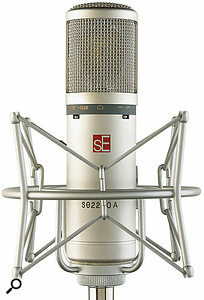 On the other hand, if the singer has a thin or edgy voice, the SE2200 will help polish and support it. As the SE 2200A is a warm-sounding capacitor, the alternatives that spring to mind are the new Audio-Technica AT2020 (around £100) and the Rode NT2A (which costs rather more, at around £240, but has switchable polar patterns). Alternatives for the brighter-sounding Mini are less obvious, as most capacitor mics in this price range tend to be quite warm in character, but both the Rode NT1A (around £150) and the AKG C3000B (significantly more expensive, at around £299) are in the same ball-park soundwise. Both mics offer good performance for the price. Both mics come with strong aluminium cases. Although the noise figures for these mics are typical of many of their competitors, I still feel that it should be possible to bring the figures down by a couple of dBs. Both mics offer good value but have distinctly different characters, with the 2200A offering a more flattering sound that is smoother at the high end and warmer at the low end. M1C £119; 2200A £149. Prices include VAT. Sonic Distribution +44 (0)1582 470260.